The University of Tennessee College of Veterinary Medicine held its third annual Equine Podiatry Conference on April 21, 2018 on the UT Ag campus in Knoxville, Tennessee. This in-depth seminar, for both veterinarians and farriers, attracted 25 attendees this year, six of whom were veterinarians. Registrar Barbara Campbell said this was the most veterinarians they’ve had to attend. The main attraction was Dr. Stephen O’Grady, DVM, MRCVS, veterinarian and professional farrier with Virginia Therapeutic Farriery, an equine podiatry consulting service. He gave two presentations: the first on equine anatomy and farrier principles and the second on the wooden shoe and its applications. In the afternoon, he gave two demonstrations: applying the Wooden Shoe to a patient at UTCVM and Managing the Negative Palmar Angle in the Rear Limbs. Dr. O’Grady combines his skills as a veterinarian and a farrier to better understand the medical physiology and the mechanics of the equine foot. Dr. O’Grady’s methodology utilizes the basic principles of farriery combined with advanced technology to treat problems of the equine foot. Dr. O’Grady says the farrier is responsible for maintaining a healthy functional foot and the veterinarian is responsible for whole horse health. But “good farriers look at the whole horse, too,” he said. While the conference was for veterinarians and farriers, there was plenty of good information applicable to the horse owner. 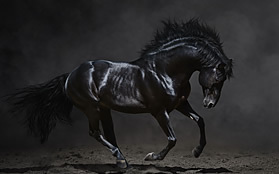 Being able to see proper farriery work on one’s horse is important, not only to improve performance, but also to maintain good hoof and overall health of the horse. Dr. O’Grady spent considerable time explaining proper trimming of the heels, i.e., the palmar foot. He gave several photo examples of trimming to maintain proper angle of the bones and joints. If the frog grows too far forward, the load goes onto the bone. 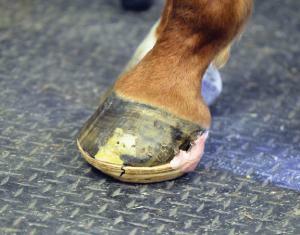 He showed examples of a hoof wearing too small a shoe, which allows the heel and soft tissue to hang out the back, which means the soft tissue is not being contained in the hoof capsule. Next, Dr. O’Grady turned to farriery in the hind feet, a topic that has not been as widely studied as the forefoot. He said, “The front feet are weight bearing; the rear is propulsion. There are different biomechanical forces in the hind foot, compared to the front foot. These differences are due to weight distribution, propulsionary function, and shape of the hind foot.” Compared to the front hoof, the hind hoof is narrower, has a higher hoof angle, the toe is pointed, has a deeper sole concavity, and has some flare in the lateral wall, while the medial wall is straight. The center of rotation correlates with the widest part of the hoof, and is further plantar in the hind foot. In the hind feet O’Grady pointed out how a shoe too small allows the heels to bulge out behind the shoe, therefore not keeping all the soft tissues and bones within the hoof capsule. “Too often a horse has a smaller shoe than it needs,” he said. 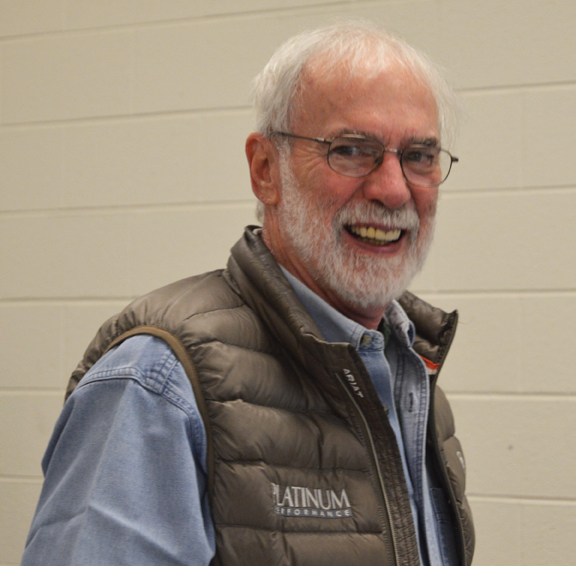 In the second half of his presentation, Dr. O’Grady asked what’s new in the study of laminitis? James K. Belknap, editor and Raymond J. Gear, associate editor, have a new book out, Equine Laminitis (2017). 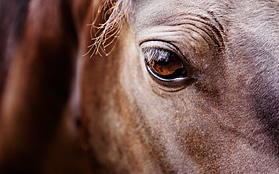 “With laminitis, look to prevention. We can’t cure it, but we can manage it,” Dr. O’Grady said. The use of ice in treatment has become very important. “It can be miraculous, changing the metabolism in the hoof!” he said. 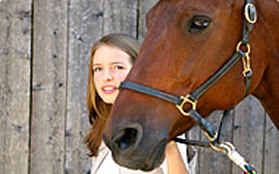 But the horse needs to be in an ice slurry up to the knee/hock for at least 48 hours with acute laminitis. This cools the whole limb – the vessels in the leg going to the hoof. Just 10-15 minutes on the hoof is not extensive enough or long enough. Other important measures are: using two views in radiology and the use of wooden shoes. The lateral view radiograph evaluates P3 in a dorsal palmar plane. The DP (dorsiplantar) view radiograph evaluates P3 in a lateral medial plane. He said it’s important when taking radiographs of the front feet, to take them with both front feet on the blocks. He said taking radiographs of the back feet is more difficult because a horse does not want to stand with both hind feet on blocks. 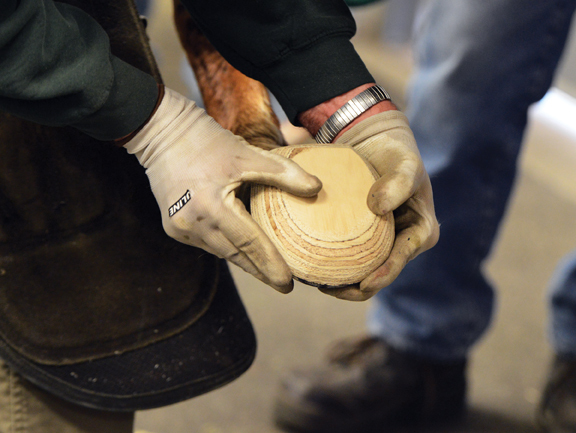 The wooden shoe provides another farriery option for treating chronic laminitis. It appears to distribute weight bearing evenly over a specified section of the foot due to its flat, solid construction. The shoe is beveled all the way around to take the load off the toe. The shoe can easily be altered, according to the radiographs and conformation of the foot. With more rotation of the coffin bone, the shoe can be made thicker to take the pressure off the toe. Dr. O’Grady gave in-depth explanations and illustrations of use of the shoe with acute and with chronic laminitis, and the stages in application of the shoe. His afternoon demonstration put in the practice the principles he explained in his talk. “There are three treatment principles with laminitis,” he said. (1) Redistribute the load. (2) Reposition the breakover. (3) Heel elevation if necessary. “The position of the digital phalanax is the main thing we have to look at in the radiograph.” Realignment of the distal phalanax – “it’s the trim!” he emphasized. There were a number of sponsors and vendors with all kinds of products for farriers, as well as plenty of door prizes from the sponsors for those attending. About the speaker: Dr. O’Grady was a professional farrier for ten years prior to obtaining his degree in veterinary medicine. He learned the farrier trade through a formal three-year apprenticeship under Hall of Fame farrier, Joseph M. Pierce of West Chester, Pennsylvania. He attended Haverford College and graduated in 1981from the University of Pretoria, Faculty of Veterinary Science in South Africa with a DVM Degree.